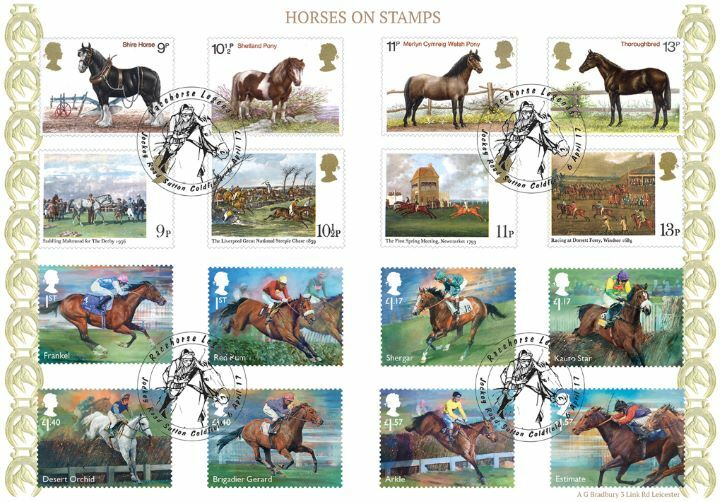 Notes: In addition to the new set of eight stamps, these covers also bear the set of stamps issued in 1978 to mark the centenary of the Shire Horse Society and the 1979 set of stamps marking the bicentenary of the Derby. These are actual stamps issued by the Post Office. The above Royal Mail Racehorse Legends stamps were issued on 06 April 2017 by Royal Mail and feature the following stamp designs: 1st Frankel; 1st Red Rum; £1.17 Shergar; £1.17 Kauto Star; £1.40 Desert Orchid; £1.40 Brigadier Gerard; £1.57 Arkle; £1.57 Estimate. The Horses on Stamps first day cover with the Sutton Coldfield, Jockey on Horseback, Special Handstamp postmark has been produced by Bradbury and features these stamps which can make a very collectible and lovely gift.